Old World Voyages to Australantis. This waterfront excavation, filled with basalt rocks, was once constructed for small vessels to be loaded with gold ore from an adjacent open-cut cliffside mining operation. From here the boats transported their cargo into nearby Sarina harbour to the smelters. Photo copyright © Rex Gilroy 2008..
and so it pushes all other novelties into second and third place. It does not read like history but like the most beautiful lies. And all of a fresh new sort, no mouldy old stale ones. and contradictions, and incredibilities; but they are all true, they all happened”. ”Every truth passes through three stages before it is recognised. In the first, it is ridiculed. In the second, it is opposed. 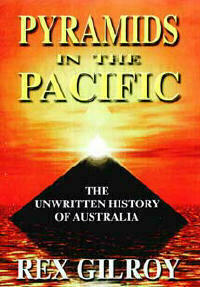 Lost Egypto-Phoenician Colonies of Queensland’s Far North. 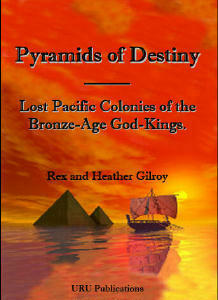 Egyptian and Phoenician Colonists of Sarina. “By ship our ruler, Prince Tet-Sexer, arrived here, sailing upriver to the temple. of dawn, at whose hour we pray to Ra, whose eyes watch over us in the mountain mines. temple dedicated to Ra, at Sarina Mid North Queensland, November 2000. During the early months of 2000 the media was alive with reports that residents of the Mid North Queensland coastal town of Sarina, had identified a massive stone causeway jutting out from the shore into Sarina Inlet as an ancient wharf, constructed by Phoenician colonists in Bronze-Age times [ie 2000-1400 BC], and that it was built to transport minerals mined around the foreshores of Sarina Inlet, onto triremes for shipment home to Red Sea ports. As ‘evidence’ they produced a number of “ancient relics” recovered from the rubble of the wharf [in the vicinity of rusting metalwork, being the remains of 19th century whalers’ operations], which they identified as ancient Phoenician items dating back to Biblical times. One of these metal items, once freed of its thick oyster and rust coating was found to be a bronze spear-like tool 1.79m in length. This was thereafter hailed as a ceremonial temple spear. When we first saw the relic I realised at once that it was a tool used by 19th century whalers for cutting through whale blubber. In fact all the other “ancient relics” found in the wharf rubble were identified as 19th century whalers’ tools! It did not take very long for university-based archaeologists to use these ‘relics’ as an excuse to dismiss the Sarina wharf as the ruined remains of a 19th century whaling station, while others dismissed it as a wharf constructed by early sugar farmers. Yet it can be demonstrated that the wharf is of pre-British origin, and that it was the centrepiece of a huge Egypto-Phoenician mining colony, which covered the present town area extending some distance inland to the mineral-bearing hills and mountains west of the coast. A group of amateur geologists soon formed a club to identify ancient open-cut mining sites throughout the Sarina district. Their enthusiasm got the better of them for they identified many 19th century European gold and copper mining sites as ‘Phoenician’ without as much as one ancient Middle-East relic or rock inscription from any of these sites to support their claim! Finally in September 2000, Heather and I were called in to “sort out the mess” as it were. It was to be the beginning of years of research in this district. The Sarina district is very rich in all manner of minerals and gemstones, yet many of the minerals found hereabouts are not known to have been used by the ancient Phoenicians. Yet at some waterfront slag heaps and signs of open-cut gold and copper mining, including one impressive operation through a solid granite cliff, Heather and I did find rock inscriptions, mostly worn down by centuries of storms, but still identifiable as Egyptian, Phoenician and Libyan. In the course of a week’s searching we uncovered a number of Egypto-Phoenician, Celto-Phoenician and Celtic rock scripts, both on the coastal front and further inland. Heather and I also uncovered remains of ancient farming outside the present town, identified by recovered ancient stone property boundary markers, bearing declarations by their Phoenician and Celtic owners. At another site, on a hillside overlooking what was once probable extensive tracts of cleared farmland now covered in thick, tall sea grass and scrub, I identified a large rock slab as a farmer’s altar, as identified by the Phoenician inscriptions which covered it. Other stone slabs afterwards found in the grass nearby suggested by their placing, that here were the remains of a small temple, which inscriptions identified as being dedicated to Baal. for good crops sown on this land. Gather here [ to worship] and sacrifice to the Sun Baal. On this land for the life force gather for Baal”. “Light a sacrificial fire. At Baal’s temple of the Sun make offerings to Him”. send forth you water for the tilling of the soil”. “The Sun’s light, the water of the Sun, Baal, the Sun. His enclosing serpent rays protect us all”. On our first investigation of the Sarina sites, we made a detailed study of the causeway, which we found to be constructed with thousands of tonnes of ancient mining rubble. We found the outline of a 3m square shrine whose stone walls had long ago fallen away, the name ‘Baal’ engraved upon a boulder. An undoubted ancient wharf, we measured it at 800 metres in length by 30 metres width. It was at least 6m above water at low tide, and 4m at low tide, as I found out once in 2001, when one day I was forced to wade through the incoming current that flowed between myself and the shore! The wharf stands on Freshwater Point facing the ocean. Here triremes brought ores from offshore mineral-rich Great Barrier Reef islands for unloading at the wharf. From here oxen-drawn carts would have carried the ores from the wharf along waterfront roads to nearby smelters. Ships also sailed from this harbour loaded from the great wharf with smelted minerals from the nearby and inland mines for shipment home to the Red Sea ports. Many hundreds of people would have been involved in these activities. Among the minerals shipped out were, besides gold, silver and copper; tin wolfram and pitch blend [both used for hardening metals], andesite, cinnabar, calcite and other precious stones. Old miners of the coastal towns hereabouts discovered many years ago, that the islands off the Sarina coast had been open-cut mined in antiquity. For example, Percy Island was mined for its mineral content, while Keppel Island was mined for its vast supply of turquoise. 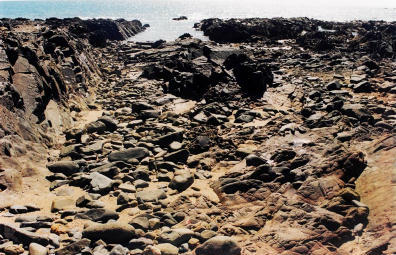 Vast amounts of minerals and gemstones were removed from many of the Queensland offshore islands in often gigantic operations. Indeed, as we were to realise as our work progressed on future field investigations at Sarina and elsewhere; untold millions of tonnes of mineral wealth was mined at the Australian colonies and transported from these shores. Where could it have all gone except to Middle-East ports on the Red Sea coast, thence to the vast treasure houses of the Land of the Nile.